Swedish customs officer [Tina, played by Eva Melander] with a special talent for detecting contraband must ultimately choose between good and evil in the idiosyncratic thriller Border, an exciting, intelligent mix of romance, Nordic noir, social realism, and supernatural horror that defies and subverts genre conventions. Destined to be a cult classic, this absorbing second feature from Iran-born, Denmark-based director Ali Abbasi is based on a short story by Let the Right One In author John Ajvide Lindqvist, whose oeuvre and fandom is comparable to that of Stephen King and Anne Rice. Ali Abbasi’s second feature […] is a bracingly original fusion of twisted fairytale, folklore, police procedural, tragic romance and existential drama. It is mesmerising in its initial oddness and develops into a complex, richly satisfying piece of storytelling in which all the seemingly jagged, awkward edges eventually fit smoothly together. One of the things that truly impresses about Border is the way Abbasi successfully juggles so many disparate plot elements and then brings them together like a well tuned orchestra. […] Abbasi is also commendable in the way he plays some of the film’s more grotesque, gothic elements entirely straight, but also teases out all of the humour and humanity in Tina’s plight. […] Eero Milonoff is suitably seductive and revolting as the mysterious Vore. 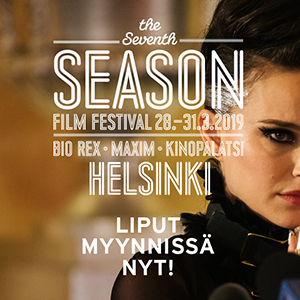 Actor Eero Milonoff will be present at the screening on 27 September at Bio Rex at 18.30.